Last week, Governor Brian Sandoval led the groundbreaking for Ice Age Fossils State Park, a 300-acre state park unit surrounded by Tule Springs Fossil Beds National Monument. This new state park is a major step forward for Protectors’ dream of connecting Clark County students with the Pleistocene past, and engaging visitors to explore the rich history of the fossil beds. If we win — the prize money is dedicated to helping State Parks build trails we can enjoy when the park is ready for visitors next year! 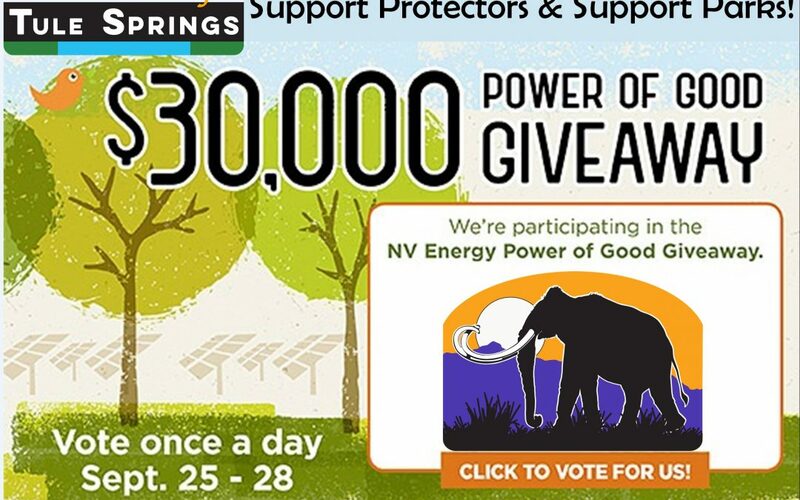 If you live in Nevada, please support us by VOTING for Protectors of Tule Springs. Voting starts at 8:00 AM on Tuesday, September 25th and goes through Friday, September 28th. You can vote once a day, every day, and HELP BUILD A PARK, by clicking here!